According to a report from KHL insider Igor Eronko, Russian winger Vitali Kravtsov will make his NHL debut with the New York Rangers once his KHL season with Chelyabinsk Traktor is over. 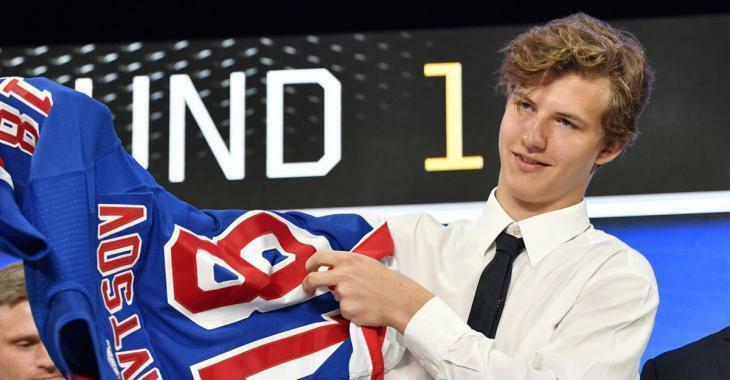 The supremely talented Kravtsov was drafted in the first round, 9th overall, by the Rangers this past summer at the 2018 NHL Entry Draft and is having a strong season as a teenager with Traktor in the KHL so far this season. He has six goals and 17 points in 32 games to lead the team so far. If Kravtsov’s NHL debut seems too far away, remember that the KHL season is considerably shorter than the NHL’s. The regular season wraps up the last week of February and the Gagarin Cup Playoffs begin the first week of March. Typically the championship concludes about the middle of April. So, there’s a good chance that the Rangers will have Kravtsov for the entirety of March and April, 2019. Mike Milbury drops F-bomb live during game broadcast! Hamilton being called a coward, and worse, after the most embarrassing play of the season. Multiple goaltenders call out the NHL over controversial goal in Bruins/Leafs series. Leaf fans set Bruins fan on fire after Game 6!